Here we see the geocentric view of this morning's planetary distribution across the skies. We have the SUN in 25 degrees Leo, conjunct with Pallas, and nearby Mercury, gone STATION after the usual RETROGRADE period elapsed. A lot of problems this has caused, we are all glad it is over. As we have shown on numerous occations here on this blog, Mercury station comes with a lot of noisy earthquakes as we have seen, an example the one in Costa Rica of magnitude 6.1R. 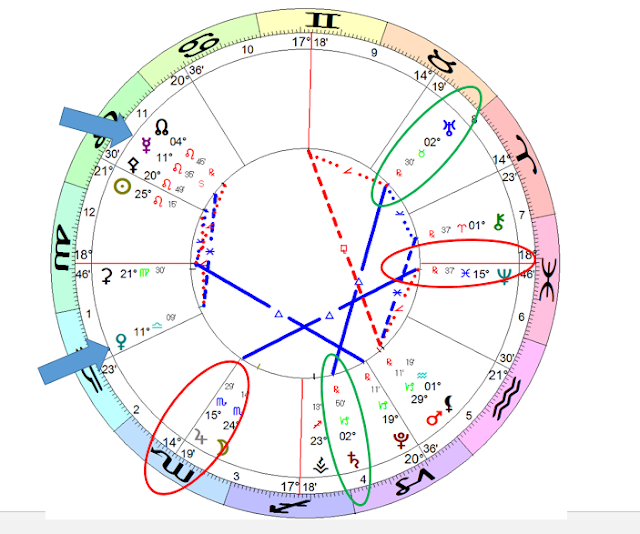 The two arrows shown in the chart above show the perfection of the sextile between Venus and Mercury this morning. This perfection was triggered yesterday by the passing Moon and wehave seen a significant change of weather, in many places across the world. In my part of the world, the winds have dropped significantly. for example. So Mercury and Venus are in good terms right now. The other aspects we have to discuss are first perfect trine between Jupiter and Neptune shown in red above. This, with the change of mood of Mercury has helped calm the seas around here. We see the Moon has passed a conjunct with Jupiter. Heliocentrically however, we see JUPITER SQUARE EARTH today and tomorrow .Finally all this is happening in a background of another trine, between Saturn and Uranus. Both of them currently in retrograte motion. So, in short, Harmony this morning, dont we all deserve it? Be Safe Be Good.